“Cowboy Poetry CD of the Year” Finalists! Read "Rick Huff's Best of the West" review of "Horses and Happiness"
Read "Rick Huff's Best of the West" review of "Rhyme 'Em Cowboy!" International Western Music Association 2018 Top-5 Male Cowboy Poet of the Year. 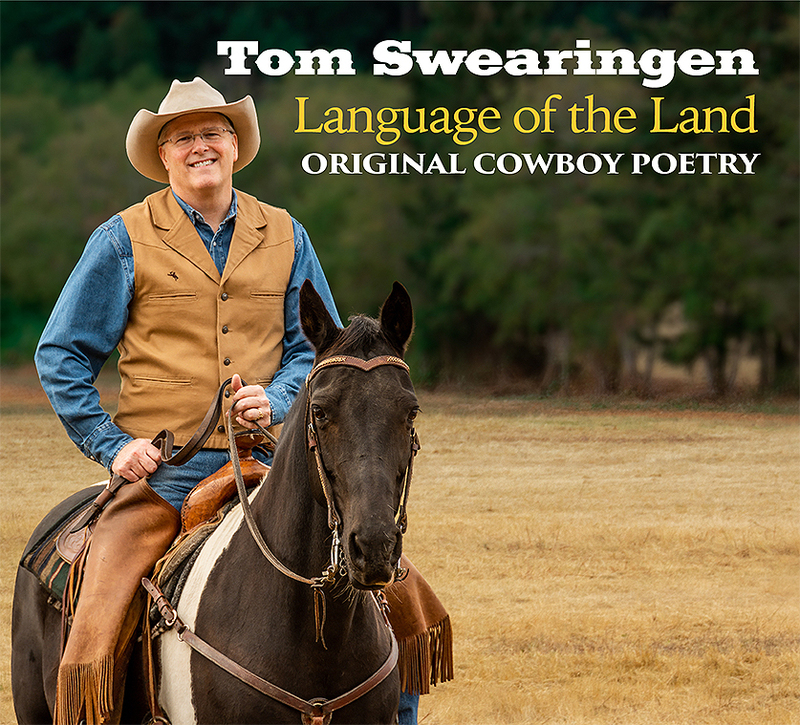 Tom Swearingen tells stories of the people and land of the American West through original cowboy poetry that is often inspired by his own experiences and observations from the saddle. Some are humorous, others serious, and all entertaining. Tom brings his stories to life with rhythm and rhyme and a storytelling style that makes him a popular performer not only at cowboy gatherings and horse camps, but at libraries, historical centers, and wherever else you find folks who appreciate the cultural heritage of the West. 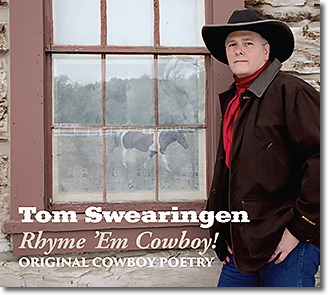 Tom is two-time winner of the National Finals Rodeo Cowboy Poetry Week Contest, and has been nominated by both the International Western Music Association and the Academy of Western Artists as Male Cowboy Poet of the Year. His Horses and Happiness CD is a two-time IWMA finalist for Cowboy Poetry CD of the Year. His Rhyme ‘Em Cowboy! CD debuted on the Summer 2016 Western Radio Charts as the #2 most played poetry album, and has been recognized as a finalist for IWMA 2018, 2017 and 2016 Cowboy Poetry CD of the Year. 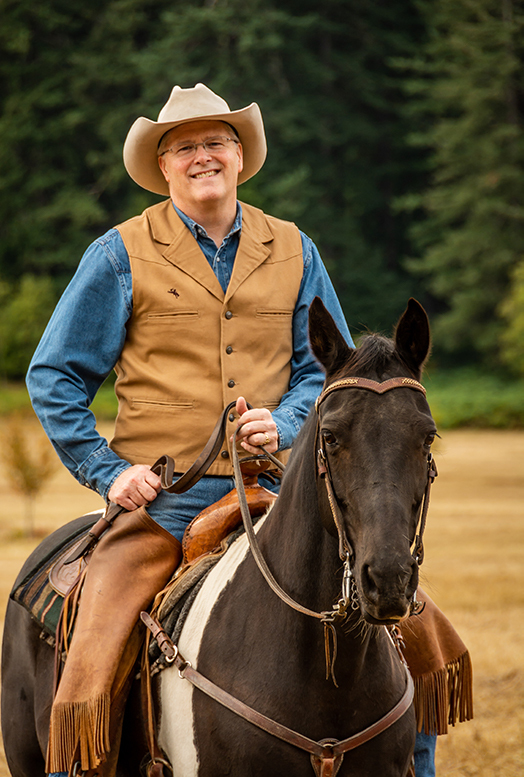 Tom and his wife live in Tualatin, OR and can often be found riding their horses in Oregon’s backcountry. As with his first two CDs, which were International Western Music Association “Cowboy Poetry CD of the Year” Finalists, Language of the Land was professionally recorded during a live concert performance. Language of the Land includes fourteen original poems plus an introduction and bonus recitation of the Bruce Kiskaddon classic The Gentle Hoss. In addition to the title track, the CD features Tom’s poems Ropin’ Mama’s Llama, Keep ‘em Moving Slow – Coming Storm, Keep ‘em Moving Slow- Next Morning, Oh No You Don’t!, In the Shadow of Tree Line, Folks Who Do Know Horses, Bombproof Pinto Mare, Only Place for Me, A Few Lines for Oregon, Cowgirl from Nantucket, Someday, St. Paul Rodeo, and History and Pride for a total of 16 tracks.